This was supposed to be the year that Aaron Sanchez took the next step forward. It was the year he was supposed to become the Blue Jays’ ace. Instead, he’s been shut down for the season. TBJ announce that RHP Aaron Sanchez will not pitch again this season. Following his latest injury setback, the 25-year-old has been shut down for the remainder of the 2017 season. In total, Sanchez made just eight starts in which he pitched 36 innings total; a large departure from his 2016 breakout campaign, when he tossed 192 innings and won the American League ERA title with a sparkling 3.00 ERA. This has become a lost season not only for the Toronto Blue Jays, who have been out of playoff contention for a while, but Sanchez as well. Sanchez’ setback is the final nail in the coffin for the Blue Jays. He was listed as one of the three players in Daily Hive’s list of second half contributors for the Blue Jays’ potential playoff push. Lo and behold, two of the three (Sanchez and Bautista) have come up short and coincidentally, so have the Jays. Throughout the year, blister issues and finger-related injuries plagued Sanchez’ comeback to the Blue Jays’ rotation. At one point, he had a portion of his fingernail removed entirely in the hopes of solving this nagging injury. In retrospect, that solution may have created more problems than anything. Sanchez suffered a ligament strain in his middle finger and he’s been told not to grip anything with his right hand during workouts. Admittedly, it’s only September, but this paints a somewhat bleak future for Sanchez’ 2018 plans. This is a pitcher whom the Blue Jays were planning in building around. Sanchez looked like he was ready to take the next step towards becoming one of the top young starting pitchers in the American League. For the time being, those aspirations have to be put on hold. Instead, Marcus Stroman has been the ace of the Blue Jays pitching staff in 2017, not Sanchez. Everything about that sentence is quite surprising because it was Stroman who struggled last season, while Sanchez blossomed into a star during his first full season as a starter. Depending on the severity of this injury to Sanchez, the Blue Jays may be back at square one when it comes to one of their most promising young pitchers. Can the organization pencil in Sanchez as one of their starting five next season? Or could this injury hamper him in 2018 as well? It’s too soon to tell if Sanchez might return to his 2016-self next year, but for now, the Blue Jays have to approach this issue with extreme caution. What initially started as a blister issue snowballed into a fingernail issue and has led to a damaged ligament in his right middle finger. Surely, nobody is more frustrated in this scenario than Sanchez himself. It’s not like he sustained a significant injury or required Tommy John surgery. This began as a blister on the middle finger of his throwing hand; a seemingly innocent ailment. However, for an athlete whose livelihood depends on manipulating a baseball with his fingertips, it means everything. Where do the Blue Jays go from here? Without the benefit of bringing Sanchez back this year in any sort of capacity, it’s difficult to gauge just how severe this injury is or how long his recuperation may take. 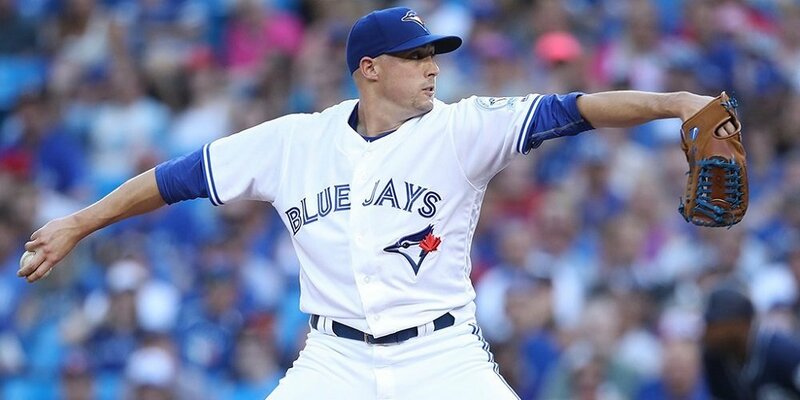 Unlike the beginning of the 2017 season, Sanchez isn’t the favourite anymore to enter the 2018 season as the Blue Jays’ number one pitcher. That title now belongs to Stroman. This was a lost campaign for Sanchez, but that doesn’t mean 2018 needs to be, too. With any luck, shutting down Sanchez for the remainder of the 2017 season will only aid in his recovery and should have him back to normal in 2018. If his 2016 campaign was any indication of what’s to come, the Blue Jays’ right-hander has an extremely bright future ahead of him. However, until Sanchez shakes this blister and fingernail issue for good, the questions will persist about his future. It would be a shame for the Blue Jays to lose Sanchez for any longer than they’ve already missed him.